I have been looking forward to publishing this blog report for many reasons. October 2018 was simultaneously the most outstanding and distressing month this blog has ever experienced. Today I want to share all the strategies I used that helped my blog to hit 140,000 pageviews in its eighth month and perhaps pull the curtain back a smidge on the mysterious and mythical world of blogging — hopefully providing you with some helpful tips and strategies along the way. For years I have read inspirational income reports published by my favorite bloggers and I thought to myself, if only. These people are making tens of thousands of dollar each month, traveling the world while blogging, and generally living a life I could only dream of. I started Squirrels of a Feather, not only as a creative outlet to share exciting ideas and projects but also as a way to make money. I am no stranger to side hustling, and I wanted to build a successful blog that could eventually deliver a full-time income. I’m not there yet — in fact, I’m not even close! But I’m on my way! After all, blogging is a journey. (Right now I am dreaming of the day when I can replace my husband’s income and retire him. Then I can come home to HIM and ask him why the house isn’t clean. October is the perfect month for a moderately goofy weirdo like me; I had been psyching myself up for months about Halloween and brainstorming ideas for that spooky holiday. Of course, not everything in October was about Halloween — it doesn’t hurt to diversify. You never want to put all your eggs into one basket; this rule applies to many areas, from blog topics to revenue streams to social media (more on that soon). Besides Halloween ideas, in October I also tackled fall decor, fall recipes, wedding budgets, and a few early budget-friendly Christmas ideas. October was a stellar month for Squirrels of a Feather. My blog blasted past last month’s pageviews — in fact, it very nearly quadrupled in traffic! I would love to tell you that I did something different, that there was some curtain that I could pull back and reveal you THE WAY to getting 100k pageviews every month on your blog. 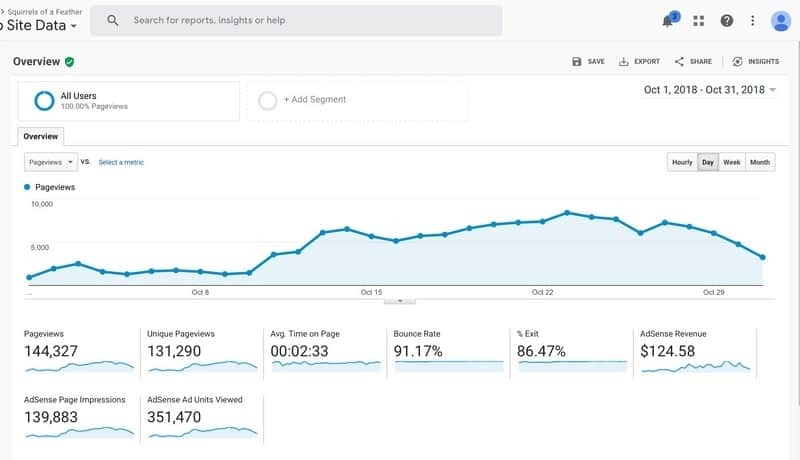 In fact, it was a combination of creativity, hard work, SEO hacking, Pinterest strategy, and a good dose of sheer luck/timing united beautifully to drive me insane traffic from Pinterest in October 2018. Multiple Halloween-related posts went viral. At times I would get 6,000 pageviews a day and my highest ever daily pageview rate was 8,600! 4 SEO Strategies That Increased My Blog’s Organic Traffic 588%! A large portion of income this month was made through the Amazon Affiliate program, which is one of the easiest and best programs to use as a new blogger. I wish I got a little more of that $7,603 Amazon pie. 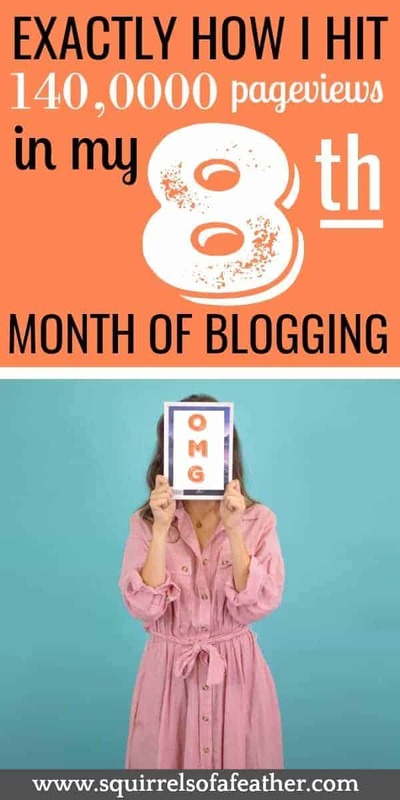 If you consider all the money that I made in my first six months blogging ($324) and then add the income from months seven ($130.30) and eight (this month – $667), that means that I have officially made my first $1,000 blogging! Even neater! A note to other bloggers out there struggling to make money blogging; I SEE YOU! I feel your pain. It isn’t easy to make money blogging. There is no one-size-fits-all solution for making money blogging. The truth is, blogging isn’t easy. I was making pennies or dollars a day for months. 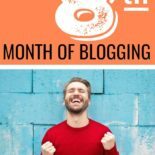 Blogging articles may make blogging seem easy as pie and can lead you to feel like you’ve done something wrong if you aren’t making $6,000 in your third-month blogging. Those results are NOT TYPICAL; every day we struggle with algorithm changes, social media, quality content creation, getting seen on Pinterest, etc. Keep trying and keep believing in yourself! There’s definitely room on the table for improvement in affiliate programs and sponsored posts. I would like to expand my affiliate relationships further, but I have just been so busy with holiday posts that I haven’t had enough time to explore. I am also very picky about the resources I recommend; I’m not going to promote an affiliate just to make money. In the future, I would also like to be better about comparing expenses with income, because honestly, I haven’t been good about tracking expenses. I have saved all receipts but still need to go back and plug them into a spreadsheet. I made a goal to start working on sponsored posts a while ago. Well, life got in the way, as life has a tendency to do. Big Brother and Little Brother both experienced bouts of illness and then the holidays rush began. That will be a definite goal for 2019! In truth, I have probably turned down about 20 sponsored posts at the time of this writing, either because I didn’t think the opportunity was a good fit for my audience or because they didn’t want to pay me enough (I don’t work for free, people). Honestly, the ad revenue I got from 140k pageviews from Google Adsense was laughable. Happily, my advertising revenue should increase in the future since I was able to get approved for MediaVine in October! I am so excited to be part of the MediaVine family; they are honestly amazing and I have been dreaming about working with them since I went to the Haven blogging conference in Charleston. Now, as a new blogger, you might be looking at my blog report, seeing my results and thinking, hey, that’s awesome! While those numbers made me happy, they were also anxiety-inducing. That’s because 91% of my traffic in October came from social media, led largely by Pinterest. Oh, Pinterest. How I love and want to slap thee! Pinterest traffic can lift you up big time, but it also isn’t terribly reliable. I have already been slapped with a Pinterest shadow ban once and felt the repeated sting of algorithm changes. That’s why seeing 90% of my traffic didn’t make me feel good. It didn’t make me feel safe. It made me feel like a polar bear standing on a melting ice block in the middle of the ocean. Whenever I write a post, of course I want it to do well on Pinterest — but I also write it in a way that helps me get that sweet, sweet Google organic traffic. Here is a snapshot of the past three days for my blog traffic in November; you can see that I am getting much more search traffic and also referral traffic. * Update: I was right to be worried about that Pinterest traffic! My traffic dropped in November and December due to an algorithm change — here’s how I recovered, increased organic search traffic, and hit nearly $1,000/month! How do I get that much organic traffic as a new blog with low domain authority? Besides suggesting the best times for you to pin by creating a Smart Schedule based on the times that your audience is engaged and pinning on Pinterest, it also gives you access to all sorts of analytical data, like which pins are the most popular, repin counts, how well your various boards are performing, etc. 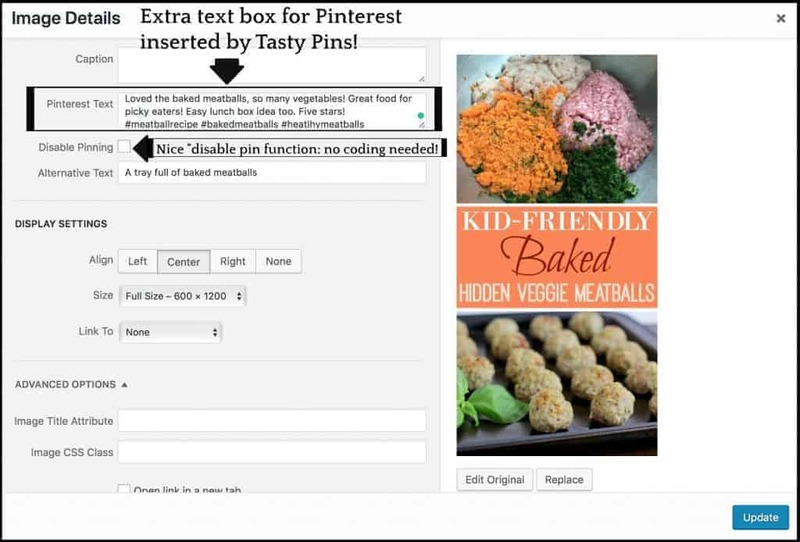 Tasty Pins is a nifty little program that helps you optimize for Google AND Pinterest simultaneously — it’s my secret weapon for getting my blog in the top search results on Google and Pinterest time and time again! I mean, do you even hashtag, bro? While Tailwind and Tasty Pins are amazing tools they aren’t the end-all-be-all way to drive massive organic traffic to your blog. In fact, I have a resource with tons of awesome tips and hacks that can help you drive more traffic to your blog. Better yet, most of them are totally free! If you want to find all the best tips and hacks that help me drive organic traffic to my blog you can now get my FREE Ultimate SEO Cheat Sheet. The Ultimate SEO Cheat Sheet comes with a nine-page instruction manual that will teach you all the top secret SEO hacks that can help you get more pageviews from Google. 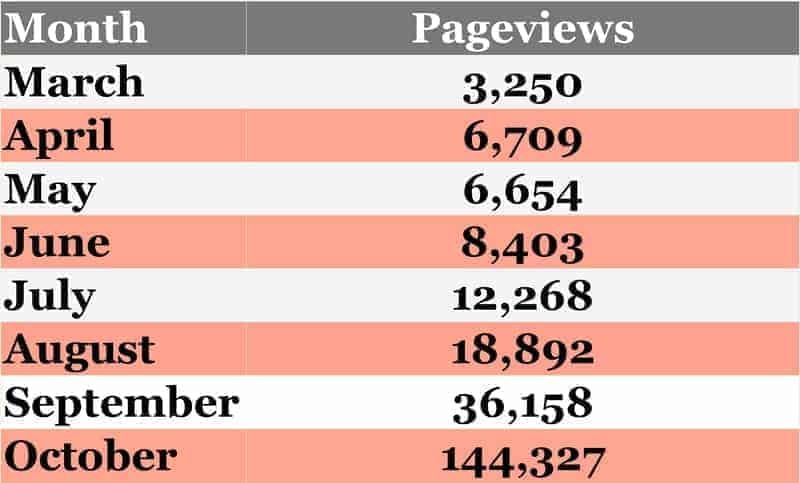 As expected, after my viral Halloween Pinterest traffic died down, so did the pageviews. But I’m not too worried because I have my organic traffic to fall back on. Stop putting all your eggs in the Pinterest basket and get your free Ultimate SEO Cheat Sheet today by signing up in the subscription box below. I hope this blog report helps you in some way. Any questions? Leave me a comment in the comment section below! Awesome, Marissa! Great tips. Pinned! Congrats on the success, Marissa! Like you, I had a bump in Pinterest traffic around Halloween/fall. It was exciting but nerve-wracking because I felt just like that polar bear you described! Focusing on Google SEO is key for me. I’ll be grabbing a copy of your handbook. Great work! Crissy, funny isn’t it? You can’t enjoy the high because you are worried about the fall. Hopefully, we can both get some more stability under our belts in the future. Let me know what you think of the SEO guide! So happy for your success and growth in your blog, dear friend! And your free guide and sheet is amazing! You never cease to impress me! Hugs! 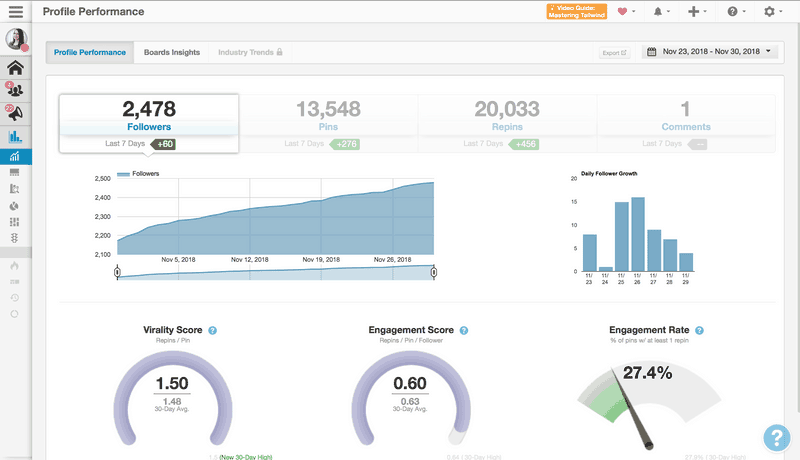 So excited to see your page view growth, very encouraging. Thank you for being so honest and open. Reading your SEO guide it is fantastic and I am only on page 3! Ooooh, I’m excited to hear more about what you think — hope you pick up some tips that will help! This is so honest and informative!! Thanks for taking the time to share this big win! Yay! Thanks for checking it out, Renee! We’re so glad that you’re happy with your switch to Mediavine! We know we’re pretty darn happy to have you. Thanks, Susannah, I have been working on different ways to get my teal stars…so far I am 4/5! Going to keep working on it, I know MV has got my back. Wow! I’m happy for you Marissa! And you got into Mediavine too – woohoo! Also, I got shadow banned too about 2 months back and am still suffering from it traffic-wise, but the fact you also got shadow banned and are successful gives me a lot of hope! Yaaaaas thanks, Haylie! Ugh, shadow banning is the worst…did it take your forever to hear back too? I think being banned in the very early stages wasn’t as bad. I hope things turn around for the better soon. Congrats girl! That’s awesome.. I am struggling with traffic right now. But, I attribute it to not being intentional. I can see just from your post that you are consistent and you have discovered what your readers truly want. I imagine many hours went into your success and hopefully one day I can be like you! This was very inspirational, thanks for sharing! Amandela, it’s true many hours a day go into working on this blog, and it can be frustrating when things don’t work out, even when you put in a lot of time! Just wait until you see November’s blog report…I was RIGHT to be worried about all that Pinterest traffic! Stay strong and I hope your traffic picks up as well…this winter has been tough on lots of bloggers! Oh good, Tracy! I am glad that you are on the right track and this helps you affirm that. Stay the course! Thanks for another great blogging post! My organic traffic is sadly low, so I will definitely be subscribing to your SEO cheatsheet 🙂 And you are doing so amazing – your husband obviously doesn’t realize how hard this blogging gig is (mine is right there with yours 😉 Merry Christmas! Aw, thanks so much, Tiffany! We will get there, slowly but surely, right? Thanks for signing up! 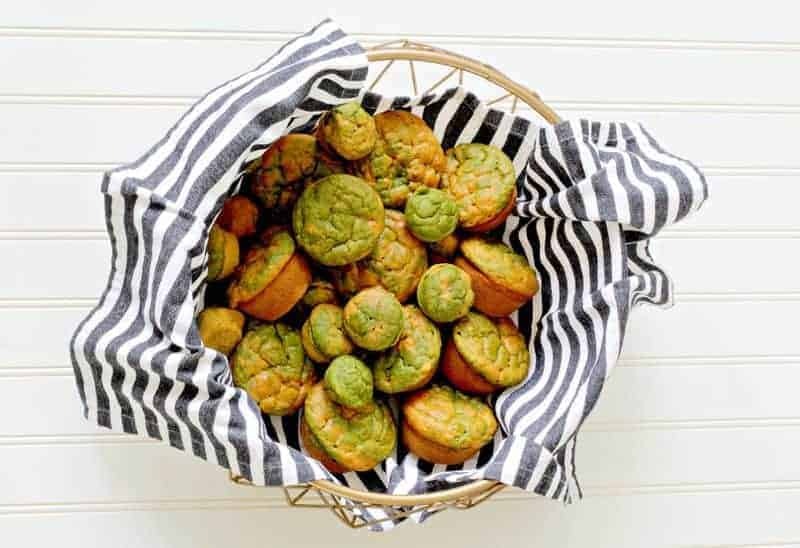 If you vegan up your Butternut Squash and Kale Muffin recipe, I’ll share it for sure. I’ll even make it and send you pics. If a) it’s a success and b) I don’t eat them all before I manage to take said pics. This was a great post Marissa! I am encouraged that someone that I have met in person is having success with blogging!! One of my goals this year is to grow my blog. I am still working on so many things with my blog and reading yours is inspiring and encouraging! Just signed up for the SEO cheat sheet and now I am clicking through more of your links! Thanks for sharing!